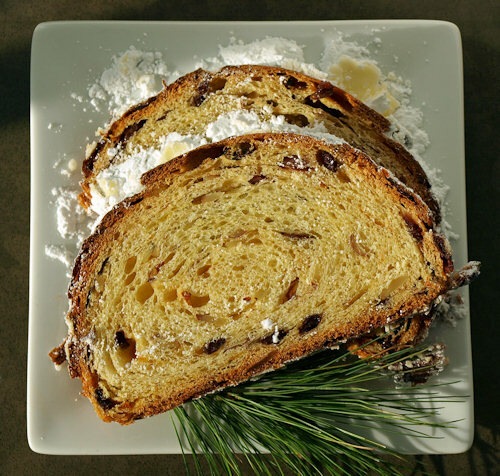 Though I do appreciate all yeasted goodies I've never been a big fan of Christmas breads like stollen and panetone. They are often dry and flavorless and I much prefer the sticky goodness of the much maligned fruitcake, even the brick like kind. 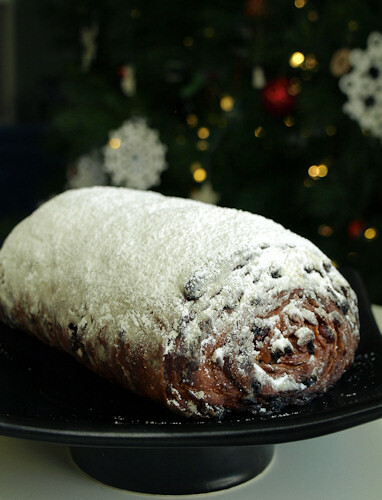 But this year I fully embraced the challenge and fell in love with stollen. I followed Penny's recipe replacing the butter with Earth Balance tub margarine. For the fruit I made my own candied tangerine peel with cognac soaked currants and dried cranberries. I used the spice combination from the Martha Stewart recipe because I have a recent obsession with mace, an extremely underused spice. To avoid having on giant stollen wreath in the house to tempt me, I split my recipe into three loaves. Two I froze and later shared one each with my parents and in laws and one I kept to enjoy. It was fragrant, fruity, yeasty and wonderful and a fitting send off because in our household we're trying out being wheat free. I made almost all of our Christmas cookies this year wheat free because my husband feels better not eating it. And I'm personally committing to all of January completely wheat and gluten free to jumpstart my diet and see if I feel better eating that way. 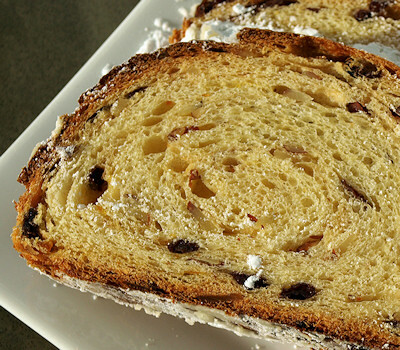 Wish me luck because I know I'll be daydreaming about yeasty deliciousness like this stollen. -Visit the Daring Kitchen and see more festive breads made this month by browsing the Daring Baker Blogroll. 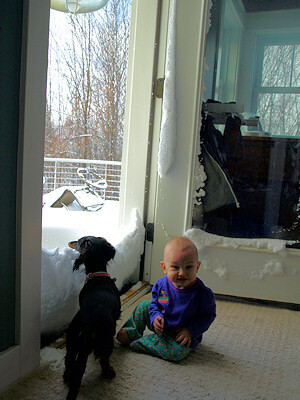 Penny and Fritz with the snow drift after the big snow on December 12th, I love birthday snow! The ducks still wander around in the snow, but thankfully we've been able to convince them that their nice heated house is the best place to spend the night. 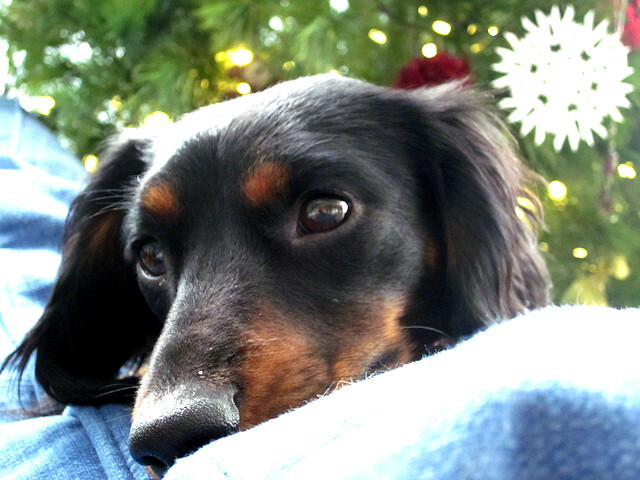 He like the rest of us is a little sad this Christmas because our oldest dog Roxy unexpectantly passed away earlier this month. We all miss her very much. 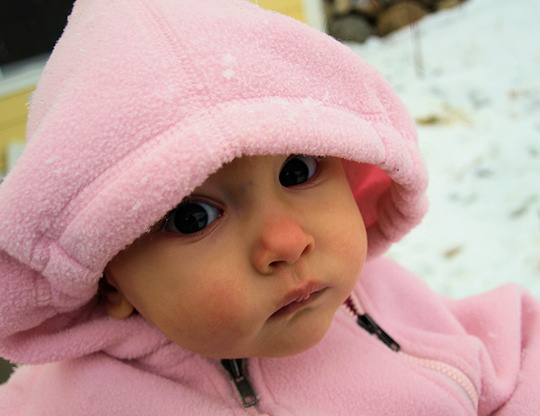 Before we move on Penny would like to present a plea on behalf of her mother. 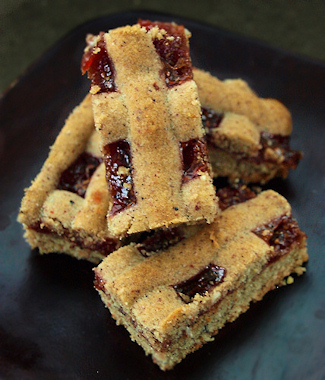 Because it's..
Click on the image above or this link and vote for Dog Hill Kitchen: Cherry Pie Lattice Cookies. Now that you are finished and have hit your back button, here's my collection of ideas for my gingerbread house for this year. 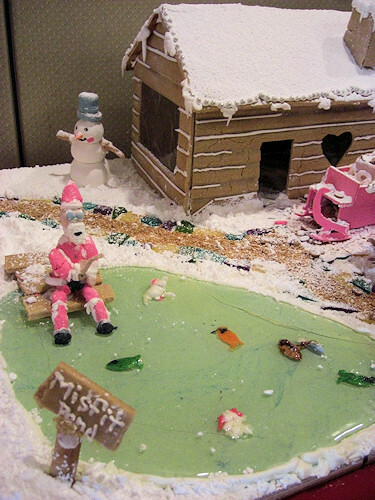 The culinary school in town had a gingerbread house contest, but sadly I learned of the contest after it was too late to enter, maybe next year. 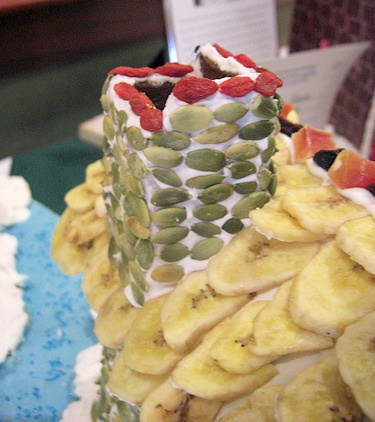 The following photos are the from the gingerbread contest which was part of the Zonta Club of Traverse City's Festival of Trees. 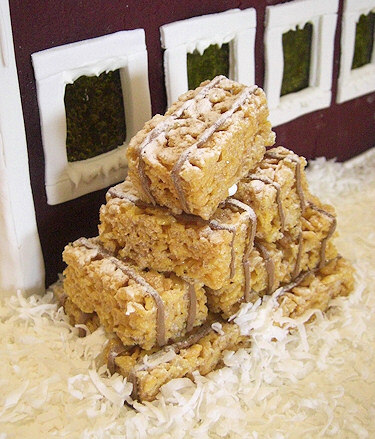 These rice treat hay bales look super cute and easy. 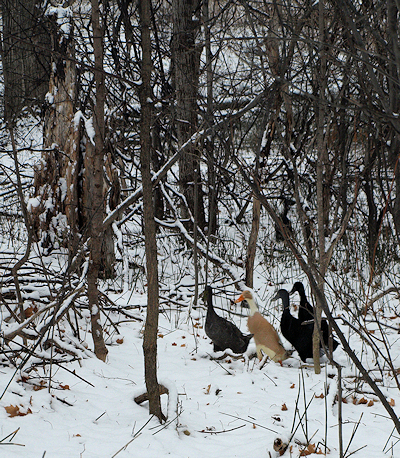 They'd be perfect with a gingerbread duck house! John liked the look of the pepita brick chimney. The banana chips shingles are nice as well. 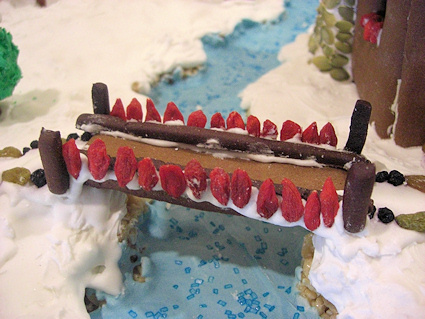 I loved the goji berry bridge. Alex is going through a big fish loving phase and thought the poured sugar pond was awesome. The grand prize winner used a lot of different homemade candy and had a great theme. 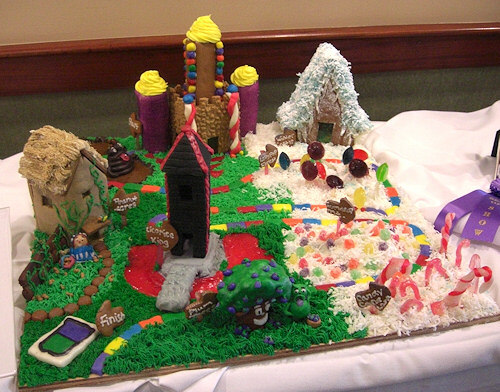 It's a gingerbread Candy Land board. For those who aren't interested in making their own gingerbread, a post on Avoiding Milk Blog lead me to A and J Bakery in Rhode Island. They sell Allergen Friendly Gingerbread House Kits. The houses are peanut, tree nut, wheat, gluten, soy, egg, dairy, and sesame free and are made in a dedicated nut and gluten free facility. They accept orders until the 21st of December. Lots of ideas to be had at the Flickr group Gingerbread House Showcase. There are some very talented people there, just look at these cute owls. Martha Stewart's gallery of gingerbread, with user created houses. 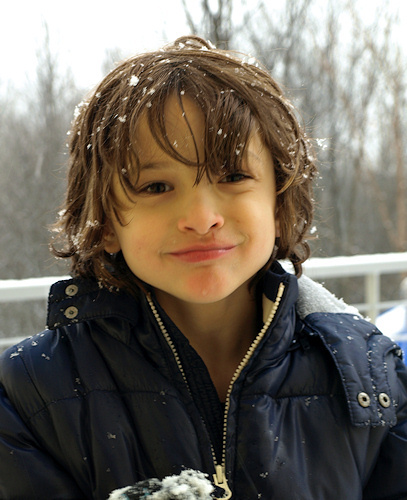 We finally got some good snow, Alex loves to eat it! Last week I received my Iron Foodie ingredients from Marx Foods. In our mystery "basket" were whole bourbon vanilla beans, Aji Panca chiles, fennel pollen, dried wild porcini mushrooms, maple sugar, dulse seaweed,Tellicherry peppercorns, and smoked salt. In an attempt to be a "serious" competitor I spent most of the week tasting and contemplating a savory entree entry. But the whole time all I could think about was Christmas cookies and cornmeal. I wait all year for the baking excitement around Christmastime and planning a new addition to the cookie round up is a big deal to me. (What can I say, maybe my life is too mundane or maybe I'm baking-obsessed?) Old favorites take up considerable cookie plate real estate so a new cookie has to be something special to earn a spot. I knew these ingredients could help an average cookie recipe become "Christmas plate worthy". I browsed my cookie recipe collection and found one I liked. This Apricot Windows recipe from Martha Stewart gave me a chance to use some cornmeal from my homegrown Bloody Butcher corn, the same corn we used to make our corn husk dolls, and it seemed adaptable to the mystery ingredients. The bourbon vanilla bean combined with the cornmeal and the maple sugar to make a brilliantly flavorful shortbread. In place of the apricot jam, my shortbread was topped with Michigan sour cherry preserves that had been jazzed up with some freshly cracked Tellicherry peppercorns and fennel pollen. 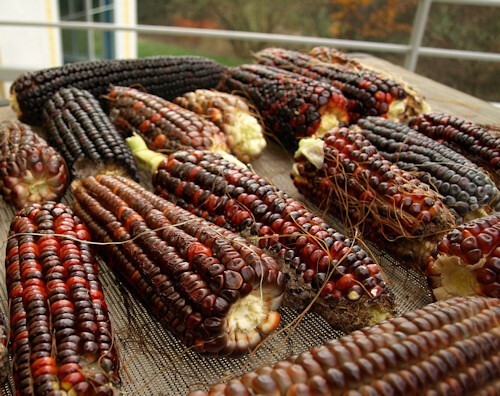 Sour cherry was a better foil for the fennel and pepper together, anise flavors go well with cherry and I love almost all fruit with black pepper. The resulting cookie had an attractive lattice-topped pie appearance and a unique flavor that will earn it a place on this year's cookie plate. 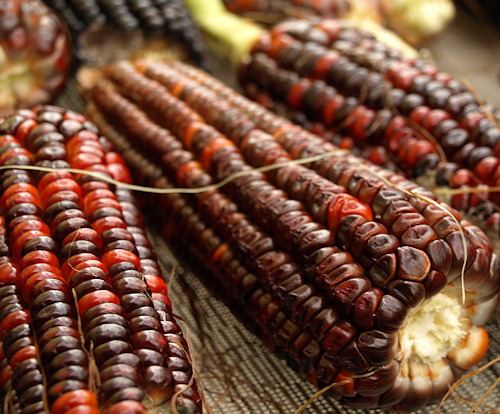 -Preheat your oven to 375 degrees F.
-In a small bowl, mix the jam with the fennel pollen and pepper. Set aside. -Place the maple sugar and butter or margarine into a stand mixer bowl fitted with a paddle blade. Scrape in the seeds from the vanilla bean and cream these three ingredients until light and fluffy. -While the sugar and butter mixture is beating, whisk together the flour, cornmeal and salt in a separate bowl. -Add the egg to the creamed butter and beat until incorporated. Add the flour mixture in three installments, beating until almost combined each time. Then scrape and beat to create a fully mixed batter. -Fit a piping bag with a #12 or #11 plain piping tip or use a sandwich bag and cut a 1/4 inch hole in one end. Fill with a 1/2 cup of batter. Fold over or close to keep the batter from drying out and set aside. 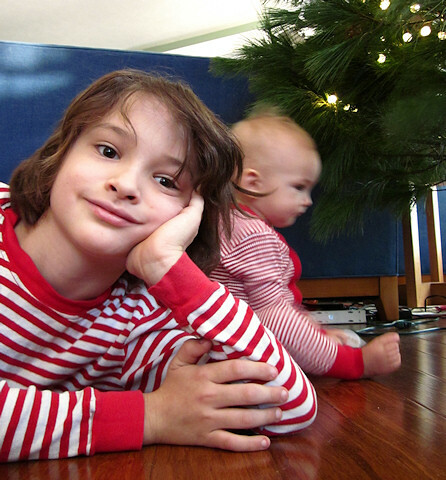 -Line an 8 inch by 8 inch baking pan with parchment paper and spray lightly with vegetable oil. To keep the parchment paper from shifting spray a small amount under the paper as well. -Spread the rest of the batter in an even layer onto the parchment lined pan. Bake for 20 minutes, until light golden brown. -Remove the pan from the oven, spread on an even layer of the seasoned jam or preserves. Then top with crisscrossing lines of piped batter approximately one inch apart to create a grid. -Return the pan to the oven and bake for another 20-25 minutes until the piped lines on top are golden brown. -Allow the cookies to cool. 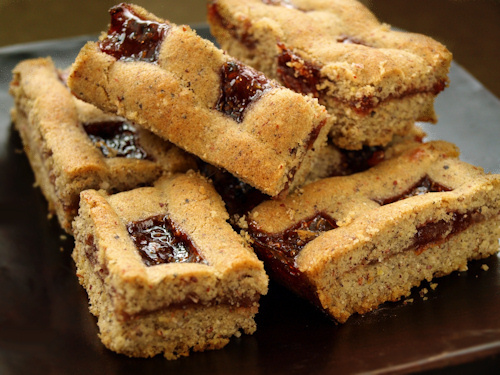 Using the parchment paper, lift the uncut cookie out of the pan and then slice into bars or squares. *Variation: These could also be baked in a removable bottom tart pan and then cut into wedges like a mini pie. I would suggest a 8 or 9 inch diameter pan. If you are a Foodie Blog Roll member you can vote for your favorite Iron Foodie dish starting Tuesday December 7th.